How to Record WhatsApp Video Call Easily? Do you need to save the special or important moments of your video calls on WhatsApp? We normally do lots of video calls on our mobile devices and forget the moments in while. Well, this is not really an option on your WhatsApp application. Yes, there are few third-party applications which can record WhatsApp video call in the easiest way possible. WhatsApp is the most commonly used video calling app. But, with these apps, you can record any other video calls as well once your setup is done. You can record the WhatsApp video calls on your Android devices as well as on your iOS also. Just set the apps to work automatically or manually as per your choice and everything is done. The procedure is really simple to execute. Note: To be sure if the procedure is working for your device, just test some video-call recordings on the device before starting the real one. Step #1: Search for the application in the Google Play Store. Download the app and install it. Then, launch the app. Step #2: Once the app is launched, set the configurations of the format of the video by adjusting the bit rate, size, audio, duration and so on. Step #3: Click on the button that reads “Record” to start recording. Step #4: Initiate a WhatsApp Video Call. Your call will be recorded. Step #5: Click on the same button to stop recording. NOTE: This application works only with Android devices. Step 1: Go to Google Play store. Step 2: Download the application and install it to have it in your Android device. Step 3: Once the installation process is complete, an icon will appear to be floating on the screen of your mobile. Step 4: Initiate a Video call. Step 5: Click on that floating icon on your screen to start recording the video chat. NOTE: The similar process can be used for several other Android applications which will help you to record WhatsApp video calls. Another honourable mention is that of Du Recorder & Video Editor. The users of iOS 11 can easily record their WhatsApp video calls with an inbuilt function which facilitates hassle free screen recording. In the case of an old phone, one can use Go Record: Screen Record. Step #1: Install the Go Record: Screen Record app on your iPhone. Step #2: Open the application once it is installed successfully. Step #3: Choose a WhatsApp contact whom you want to initiate a video call with. Step #4: With the help of the screen recording application, enable the screen recording. Step #5: Go back to WhatsApp and start the video call. The application will automatically record the entire WhatsApp video chat. These are the best apps listed above to record WhatsApp video calls in the easiest way. 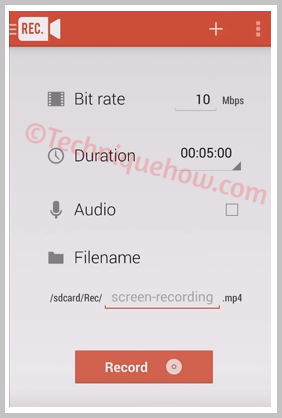 You can set the recording duration as per your wish to record calls automatically or manually directly from your devices. Techniquehow.Com: How to Record WhatsApp Video Call Easily?